Bioglan AB is your company’s partner and one-stop solution for a complete project or to meet a special need. We provide support for pharmaceutical, healthcare and life science companies in all aspects of development and manufacturing of semi-solid and liquid products. We collaborate with companies of all sizes, from the smallest start-up to the leading pharmaceutical enterprises. 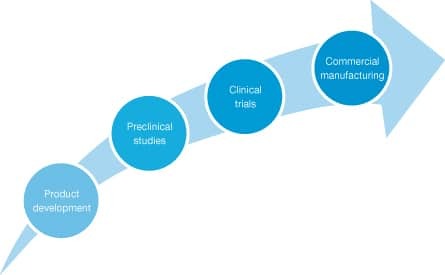 Our manufacturing authorisation from the Swedish Medical Products Agency allows us to produce non-sterile semi-solid and liquid products, whether at pilot scale for clinical trials or at full-scale to supply a large commercial market. We can even be your QP release site for other types of products. The quality system fulfills the EU GMP (Good Manufacturing Practices) requirements as well as the ISO 13485 standard for Medical Devices. Bioglan is a reliable, efficient and flexible organization that delivers your project with the highest quality at the right time in a cost-effective way in a pleasant atmosphere. We are proud that we meet the quality requirements of the global markets. Bioglan is your partner from product development to commercial production. We provide a fast route to market to save time and money and reduce development risk. Please download our company brochure for further information about our services.